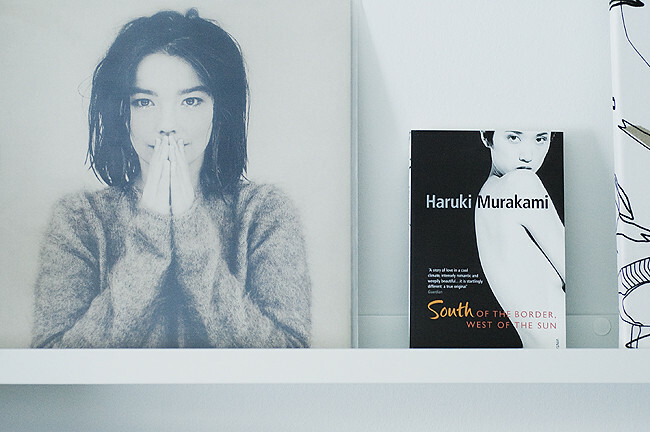 I have a new shelf above my desk, so at the moment Björk, a Murakami-book and a birdcanvas is keeping me company. I haven't really had a chance to post anything this past week, there's been so much to do - christmas shopping and wrapping of gifts, among other things. Oh, and I wanted to say thank you for purchasing the polaroid book and zenit-b book from blurb! I've had so many orders so far this month, and I'm really grateful. Annette, "Debut" is probably my favorite Björk album, even though I listen to "Medúlla" a lot more, which makes no sense at all. There is something about "Venus as a Boy" that does me in. "Vespertine" is an album I tend play only during winter, not sure why. If you post nothing between now and the new year, I hope you have a wonderful holiday! Jag köpte nyligen samma murakami bok, mest tack vare att omslaget var så fint. I just adore Murakami. I love that cover of south of the border, west of the sun too! Have fun Christmas shopping! Your Polaroid book is beautiful. Hey annette, just dropping by to say hi. your zenit b book is the most wonderful birthday gift i ever had. come and visit my blog if you got some time. thanks! bianca: I really love 'debut' as well, and I think need to catch up on listening to her other albums! I'm sure I will be able to post something every now and then until the new year arrives :) I hope you have a nice holiday as well however! sewon: I wish I had the time to read too, I have so many books waiting for me. I am such a lover of Murakami's work. I read that book a few weeks ago and I loved it so much. It is so soft. Now I am reading Norwegian Wood, if you didn't read it yet I recommend it to you. it is absolutely great. I am yet in the middle and I already think it is one of the bests (I've read quite a lot).